When the air turns cooler and the grass begins to grow more slowly it can seem like your lawn care work is over for the season. The truth is, fall is one of the most important times for lawn care. If you take the time to care for your lawn properly during the early fall, it will have a better chance to be healthier when it begins to grow again the following spring. There are several ways you can boost your lawn’s performance just before it goes dormant for the winter. Specific fall lawn care can change depending on what type of grass is predominant in your lawn. Most lawns in North America are made from either warm season grasses or cool season grasses. It is important that you identify which type of grass you have before you begin your fall lawn care efforts. Since most of the grasses that are traditionally used in lawns throughout North America were brought to the region from Europe, they require fertilization to provide the nutrients they would have received naturally in their original climates. Warm weather grasses don’t require as much care in the fall as cool season grasses do because the warm weather grasses go dormant more quickly. To maintain a healthy cool season lawn, add fertilizer during the early fall to replace the nutrients that were lost over the warm summer months. The fertilizer will also stimulate the growth of new root systems during the dormant winter months, which will cause the grass to grow more thickly in the spring. Fall is the best time to control broad leaf weeds that can mar a beautiful lawn in the spring. Dandelions and clover tend to prepare for the winter months by pulling all of the nutrients from their leaves down into their roots. Autumn is an ideal time to use an herbicide because the poison will be drawn down into the roots along with the plant’s leafy nutrients. If you treat your weed problem in the fall, you will notice a dramatic difference in the amount of weeds that pop up once the weather turns warm again. Don’t worry about any brown spots that might appear where the weeds were. Healthy grass will quickly fill in the dead spots. The fall is also when you need to check the amount of thatch that has built up in your yard over the summer. Thatch is composed of dead grass clippings, clumped root systems, and other collections of tightly packed greenery that can choke your lawn and keep it from thriving. The best way to see how much thatch has developed is to use a shovel and dig a small cross section from the top of your lawn. If there is more than an inch of thatch built up, you will need to aerate the lawn to give the grass more room to grow. Aerators can be purchased or rented from any local home improvement store, or you can hire an aeration service. Lawns that are seeded or sodded in the fall will be the healthiest in the spring. The best thing you can do for your lawn is give it plenty of time to grow and develop deep root systems. If you plant your seeds in the fall, they will have all winter to germinate and begin to grow. Planting seeds in the spring or summer means that they will try to grow more quickly, which can make the lawn sparse. Sodding in the fall allows the root system to develop much more slowly and deliberately than sodding in the spring, which means your yard will be green and lush earlier the following season. Sometimes it can seem like a losing battle, but it is important for your lawn that you continue to clear falling leaves away as often as possible. Stacks of dead leaves will shield your grass from the sun and cause it to die fairly quickly. Moist dead leaves can also lead to diseases and mold that can be very harmful to your lawn. Clear the leaves away at least once a week for the best results. Dead leaves make excellent organic compost that can be used to fertilize your lawn once it has decomposed properly. Good tips for me. If you leave your lawn full of leaves, there is a good chance your grass won’t grow in as well. 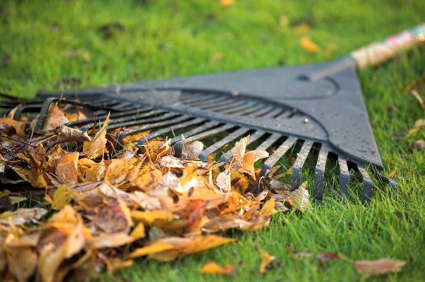 Make sure your leaves are raked and put away before snow hits!